Kevin's on fire, training hard up GMR. Today he made it to Monroe. I can’t decide which title best fits my ride today. After hearing about my ride and making me a cup of HOT coffee, my 20-year old daughter posted on FaceBook “My dad is stupid” in less than two minutes she had three LIKES. I hope her comment had more to do with her attitude since she turn 16 and began to believe that she is enlightened. I would like to know what you think…. The ride today started after examining the weather report and seeing that by 10am the temperature would bust above 45degrees and the chance of rain would drop below 30percent (which to me means no chance in southern California). I packed a rain jacket and a head warmer, nevertheless. That’s what I call preparation. Oh, I also asked my wife to heat up the spa in a couple of hours, knowing that there was a good chance I would be a little chilled. I then began the steady climb up GMR hoping to surpass last week’s ride. 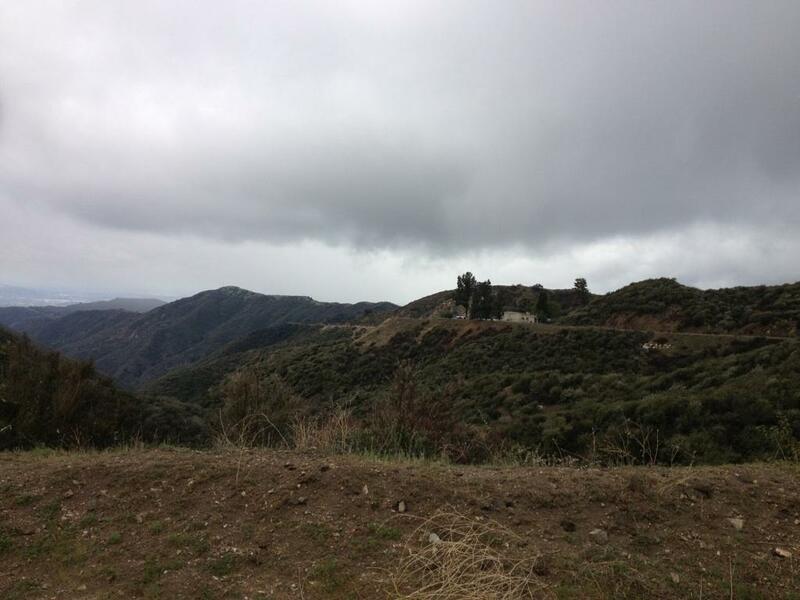 Unlike last week, it was not the quintessential GMR riding day-- cloudy and few riders. I figured maybe the fitness buffs were enjoying running the LA Marathon or were watching the finals of the San Dimas Stage Race. To which my daughter would say, “No Dad, they just use good judgment”. Imagine that, a UCSB college student living in Isla Vista extolling the virtues of good judgment, ironic. I did see a few riders descending and one passed me going up. There was little traffic and only a couple of motorcycles. 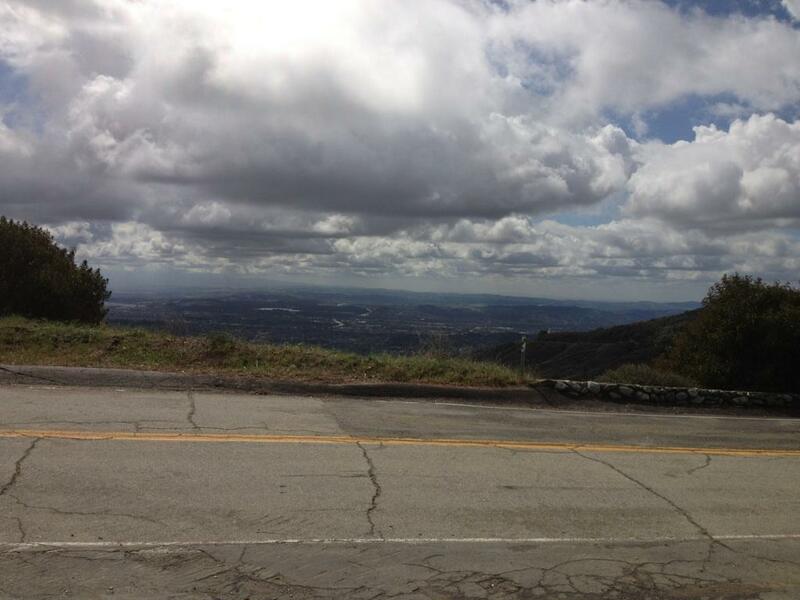 One of the riders coming down said “its cold…” another said “it snowing up there..”. They looked like they might have been coming back from Baldy Village, and I was comfortable and not going that far, so I paid no attention. Well after about 6.5 miles into the climb, it started experiencing little ice balls falling from the sky. No big deal as they would bounce off me and I stayed warm and dry. Nevertheless, I stopped at 7.5 miles to put on my jacket as it was starting to get a little chilly. See, good judgment that I was prepared. Flurries of ice ball continued as I passed the maintenance shed and pushed a little further. I stopped to rest at the junction of GMR and the Monroe Truck Trail. It was then when little flakes began to float around. It was snowing. I pulled out my camera/phone to try to capture the moment as it turned into a snow shower. My phone shut off due to moisture or cold, I am not sure which. 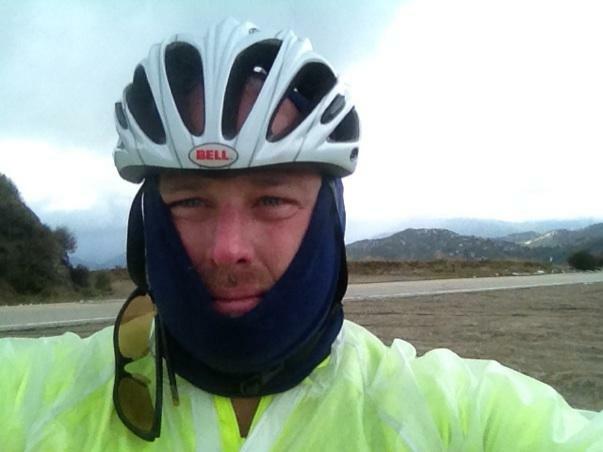 I was beginning to think about how cold it was going to be descending and I pulled on my head warmer. I even that for a second about trying to call for a ride, but I figured the snow would stop as I headed down, and my phone wouldn’t turn on. So down I went, taking it easy so as to not crash on the wet pavement. The snow quickly turned to ice balls again, then a pretty steady rain as I continued down. Despite three layers, long sleeves, arm warmers, and full finger gloves, I began to get quite cold pretty quickly. With about 5 miles to go my hands and feet were numb. I stopped and made windmill motions with my arms to force blood back into my fingers so I could have strength to pull the break levels and keep to a safe descending speed. So as she made me some coffee, while I was getting ready to go in the 104degree spa to thaw out, my daughter after hearing my story posted that I was stupid and got immediate concurrence. I tried to convince her that I exhibited both preparation and perseverance. Go Gauchos! I just had to say that because I saw UCSB in the post. Good ride too.